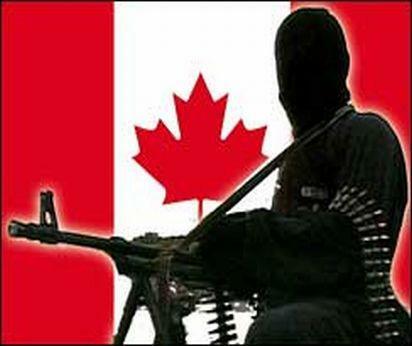 According to a reliable source a group of Canadian militants is receiving jihadi training in Al-Qaeda camps in North Waziristan for terror attacks in Canada. According to this report 12 Canadian men departed for Afghanistan last February and, after nine months, were dispatched by al-Qaeda to the Darpakhel area of North Waziristan in order to receive advanced training that include using sophisticated weapons, how to connect with local smuggling networks in North America, as well as how to use ordinary material like sugar and basic chemicals to make powerful explosives. After completing their training these militants will return to their country to execute Al-Qaeda's plan of targeting big cities in Canada. · Paul Gall aka Hafiz Ullah. All are common English and French surnames, which fits a growing trend of young Europeans and North Americans converting to radical Islam and joining the jihadi ranks. This report of the presence of Canadian Mujahidin in Al Qaeda camps in Waziristan is an additional indicator of the wide spread activity of Al Qaeda in its attempt to implement terrorist attacks on western soil. Since late 2008 , accumulated reports suggest that Al-Qaeda's Special Operations unit, responsible for Al-Qaeda's external operations (Outside Afghanistan and Pakistan, aka External operation unit), has been able to rehabilitate its operational capability and maintain, and perhaps even extend its activity in recruiting new operatives, providing designated training for terrorist operations and plotting attacks in the international arena. Vinace Brian plot to target LIRR in New York. Najibullah Zazi plot to target New York Subway system. A Plot to target commercial centers in North West England. A Plot to target western facilities in Norway. · Mahmud Mansoor Jabara was supervising on behalf of Al Qaeda special operation unit ( personally picked for the job by Osama Bin Laden and Khaled Sheikh Mohamed ) a joint plot of Al Qaeda and Jamm'a Islamiah (JI) to attack western facilities in Singapore using truck bombs in Early 2002. · Abd Al Rauf Jdey was probably selected by Al Qaeda special operation unit to conduct a suicide mission. His martyr video was found among the wracks of the house of Abu Hafs Al Masri , Al Qaeda military chief at that time. Reliable sources within Al Qaeda claim that Jdey eventually conduct a suicide mission that cause the crash of American Airline flight 578 from JFK to Santo Domingo using explosive hidden in his shoes on November 12 2001. In light of this report it seems that the Canadian operatives are in the final stages of their training in Waziristan and are about to enter the next phase – reentering their home country and begin preparation for attacks - shortly.